GableVision recently installed a new digital signature piece that brings attention to the M&T Bank brand identifying M&T Bank Stadium, the home of the Baltimore Ravens. Working with the Baltimore Ravens, M&T Bank launched their new brand, and GableVision was asked to provide solutions for a larger, brighter, and unique dynamic signage display. 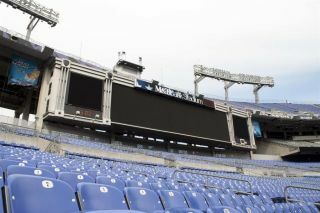 GableVision began working on several optional solutions to meet both the needs of the Ravens and M&T Bank. GableVision has installed a new signature identifying “M&T Bank Stadium” above the two end zone scoreboards. The display offers a colored, animated digital display along with illuminated LED letters replacing older letters that have identified M&T Bank Stadium since M&T Bank earned the naming rights to the stadium in 2003. To create a solution, a 5’ x 67’ LED Digital Display by GableVision was recommended and incorporated as the signature piece of the main M&T Bank Stadium identity. The digital display signature piece allows the stadium content operators complete control to create dynamic, colorful, and animated content that highlights the M&T Bank identity. The project marks the second time Gable has been called upon to provide a unique solution at M&T Bank Stadium. In 2003, the Maryland Stadium Authority, along with the Baltimore Ravens and M&T Bank, selected Gable as the primary contractor to implement the re-branding of Ravens Stadium. Gable produced the (4) primary Identity signs on the exterior of the stadium in 2003.